The new Mercedes-Benz Sprinter will push ahead with the brand’s plans to offer comprehensive mobility solutions when it launches in 2018. The new Sprinter will offer a new telematics service, said to bring a leap forward in efficiency for vehicle and fleet management. Previewed in sketch form as the Sprinter debuts at the North American Commercial Vehicle Show, the third-generation model – due out in the first half of next year – will feature a new telematics solution, said to bring a leap forward in efficiency for vehicle and fleet management. It will also offer the comprehensive introduction of driving assistance systems and connectivity services as well as a much larger range of variants to enable its adaptation to individual transport and sector requirements, with further details to follow in the coming months. 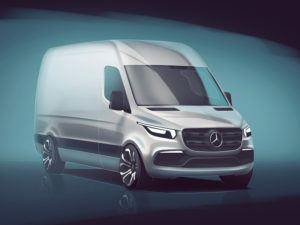 The new model, which will also bring an overhaul in design with a distinctive new front, forms part of the manufacturer’s ‘adVANce’ initiative to identify changing customer requirements and develop new solutions, which has already seen the unveiling of an all-electric ‘Vision Van’ study while this year Mercedes-Benz has trialled new services to logistics companies and drivers, and invested in a delivery robots manufacturer as it looks to transform itself from purely a vehicle manufacturer to a mobility solutions provider. “We want to do more than just build the best vehicles. We want to offer the most suitable mobility solution for every sector and for every transport assignment. And that is precisely our focus with the upcoming Sprinter generation as an overall system solution,” said Volker Mornhinweg, head of Mercedes-Benz Vans. Other changes will see the Sprinter produced at a new US plant in North Charleston, which is currently under construction, as well as the Dusseldorf and Ludwigsfelde German production sites, reflecting the demand from North American customers and significantly reducing delivery times in this market. The market launch will commence in Europe in the first half of 2018, with the other markets to follow.